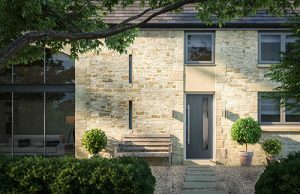 UK composite door manufacturer, Door-Stop International, has expanded its offering with three new designs, providing its customers with even more choice when creating a bespoke front door. The new options consist of a long cassette door, with a top-to-bottom window; a curved door, where the windows are placed in a vertical arc; and finally, a design that has one central windowpane as the key feature. Available in a wide range of colours and bespoke detailing, the new doors will allow customers to create completely unique designs. For example, the long cassette door, which is expected to be an extremely popular option, can be glazed in the centre, to the left or to the right. It also comes with six glazing options to choose from, including a design called Matrix, which is manufactured with a steel pattern running throughout the pane of the glass. What’s more, this door is also available in Door-Stop’s Solid Core range. Patrick Dean, Head of Sales and Marketing at Door-Stop International said: “We’re really excited about introducing the new designs to our customers – particularly our curved door, as this has the potential to really bring the “wow factor” to a home. The distinctive design will definitely suit those who aren’t afraid to stand out from the crowd or break with tradition, adding an ultra-modern twist to a property. “The glass is fitted to create a modern, organic shape that is available in eight glass designs and 17 patterns. One major advantage of this design is that it’s available across all of our ranges and is compatible with our standard, including the new Sweet collection, or contemporary hardware suites. “As we pride ourselves on providing excellent customer service, all of the new door designs will come with our three-day delivery guarantee and/or a secure guarantee, which means that if the door is broken into, we will provide a new one free of charge along with a cheque for £1000, to soften the blow.” Door-stop prides itself on providing genuine Door-Stop doors, which are branded with its mark of quality. There are many benefits to owning and supplying a genuine Door-Stop door: they are weather-proof, police approved, energy efficient and come with a secure guarantee.